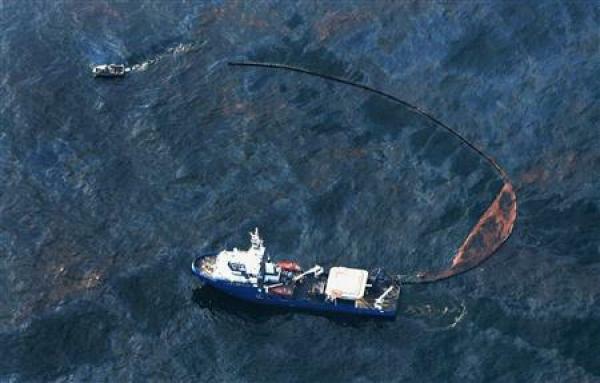 But alas, last I noticed, the substance belching from the earth’s bowels at the site of the rig wreck really is petroleum. BP is not as far down that green road as the marketing department would have us believe, perhaps not as far as they wish they were they were themselves, particularly at the moment. I have to confess: As a Louisianian, I’m really mad. (I started to say “angry” but that’s too civilized–MAD!! Maybe even “urinary streamed off,” referring to Prof. Menard’s lecture posted at the blog last week). I’ve heard BP’s mealy-mouthed statements, and I visited their web site where they portray themselves as heroically “on task,” directing an unprecedented effort to control the situation. I’m not comforted that their effort is unprecedented, because all that underscores is the fact that the impending disaster is unprecedented. Who knows what lessons we’ll learn from this mess over the next days or weeks? (Wishfully, days and not weeks?) For sure, we need to move “beyond” petroleum, although I doubt BP has the credibility to lead us to that promised land. Admittedly, as Louisianians, we’ve embraced offshore drilling for years as a boon to our economy. But before I assume my “Harry Humble” hat to assume the blame, I’m reminded that green freaks from all over the country who are wagging moralistic fingers of condemnation in BP’s and Louisiana’s face are just as addicted to the fuel from Gulf Coastal regions that runs their SUV’s and warms their bones in the winter. Hypocrites they are, like all of us. 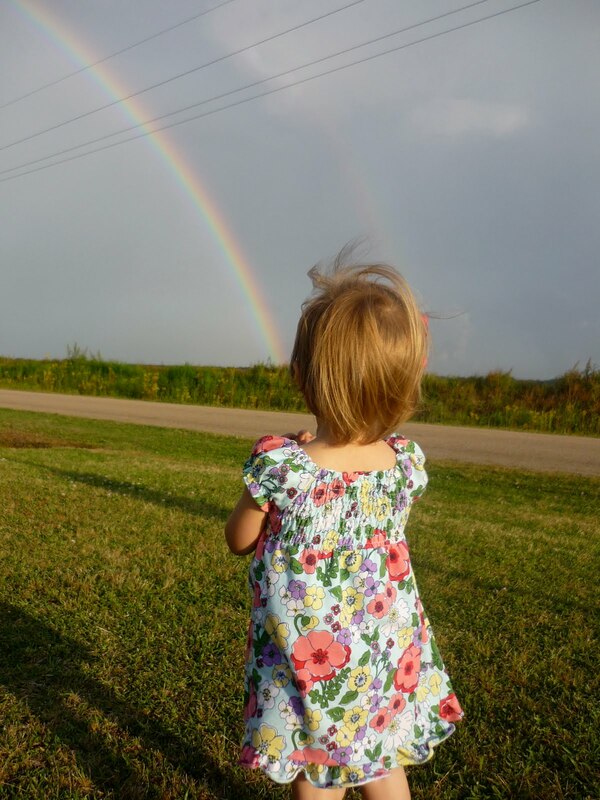 Payton admires the rainbow stretching across the Cajun Prairie in Acadia Parish. My readers know I love the prairie and its here-to-horizon panorama. This scene from central Acadia Parish, where Payton Elizabeth lives, was recently blessed by the appearance of a rainbow. In the shot, my 2 year old granddaughter seems to ponder the magnificence of God’s grand symbol of hope. Does she understand rainbows? I”m not even sure I understand. But I do admire the flatness of the prairie, and I do treasure Payton Elizabeth, and I do hold fast to God’s hope. How sweet that the photo of an innocent two-year old leads to assurance! Thanks, Heavenly Father, for rainbows, and for the flatness of the prairie, and for a grandchild who thinks Papa and Honey can do no wrong. 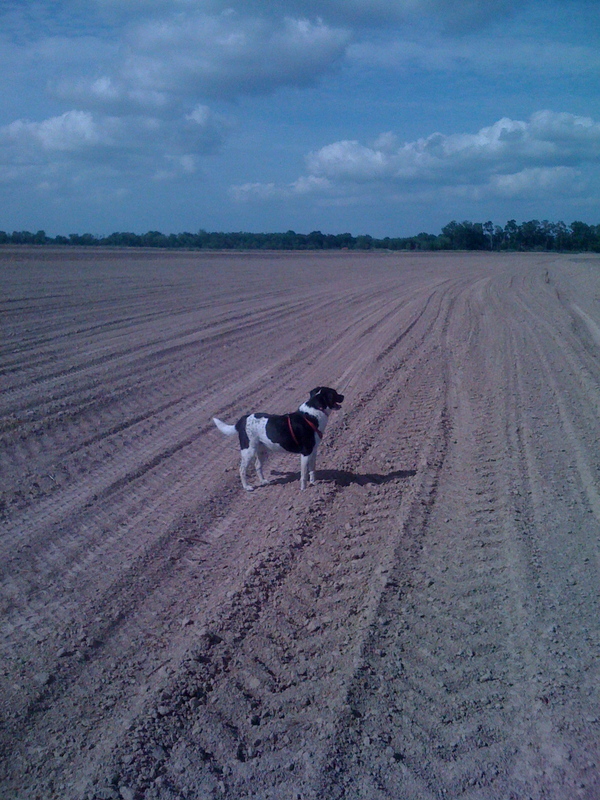 Sadie the Dog ponders her alternatives among the tractor tire tracks of this field ready for planting. I tend to post on “the flatness of the prairie” (the southwest Louisiana inland prairie of Acadiana) at least once a year. They’re good posts. The expressionless expanse of ground spreading away toward the ends of the earth strikes some as boring, but to me, the scenery is panoramic, suggestive of God’s infinity, and anything but featureless. “Flatness” after all is a feature! And our South Louisiana flatness includes other features, such as distant tree lines and fields groomed for production. So I tender this season’s “flatness of the prairie” entry, this one starring Sadie the dog, who enjoyed romping about this ploughed ground earlier in the week as she accompanied me on one of my workouts. Here, Sadie seems contemplative, perhaps even philosophical to the extent that dogs are philosophical. Perhaps she was considering the scope and depth of infinity? Or maybe she was just sniffing the breeze after detecting the scent of a mouse’s doo-doo in the tall grass along the edge of the field 50 yards away? With Sadie the Dog, one cannot tell. She’s just a dog. All I could tell is that she was happy with the open spaces and the interminable flatness of the land. I was pretty happy, too. Levees around the field suggest this ground will be flooded for rice production, but nothing’s been planted yet. We were happy that the ground was dry this afternoon, because the slightest moisture would have turned the ashen dust to gumbo mud. I’ve made the point before that one of the joys of being an academic administrator is that I have the privilege of visiting classes across disciplines and hearing lectures on subjects outside of my own discipline. The urinary system, charged with initiating urinary streams. Tonight, the subject was human anatomy, the professor my former eighth grade English charge Jeff Menard (grown up to become a physical therapist), and the lecture topic: kidneys, bladders, and urinary matters. Now all my life, I’ve heard variations of variations on the need to make potty: do number 1, make wee-wee, take a leak, whiz, fllatter my bladder (and others more colorful but less appropriate to mention). Tonight in Prof Menard’s lecture, the act thereof was elevated to the realm of science as he described men with prostate conditions, for whom “originating a urinary stream” was a challenge. So what do we have here? “To originate a urinary stream.” Nice infinitive phrase, very scientific, highly refined! How can we apply the scientific term to improve the common diction? Yay, the lofty language of science! 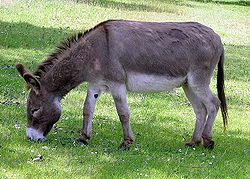 I was making the facetious point to the class that I didn’t have a sin problem with coveting anyone’s donkeys–the Commandment, after all, is a little dated. Who has donkeys any more, right? I thought I was illustrating the point safely that obeying some Commandments involves less commitment than others, but that was no excuse for breast-beating self-righteousness. OK, seriously, I want to know: How many Sunday School teachers across the land can claim he has two class mates who own donkeys? Only in Louisiana, I suspect. At any rate, reader, heed the commandment: “Keep thy covetous eyeballs off of Randy’s and Greg’s donkeys, lest ye sin!” Who says God’s writ is not timeless? Those of us subservient to the State of Louisiana for sustenance got some bad news today: the budget shortfall for the fiscal year ending just 10 weeks from now is $319 million. That means I may get a tw0-week unpaid vacation (called “furlough”) between now and mid-summer. Two weeks off? Fine, but I’d rather do it with pay! Paper, paper, everywhere: Why didn’t we do this online? institutional policy review committee meeting. 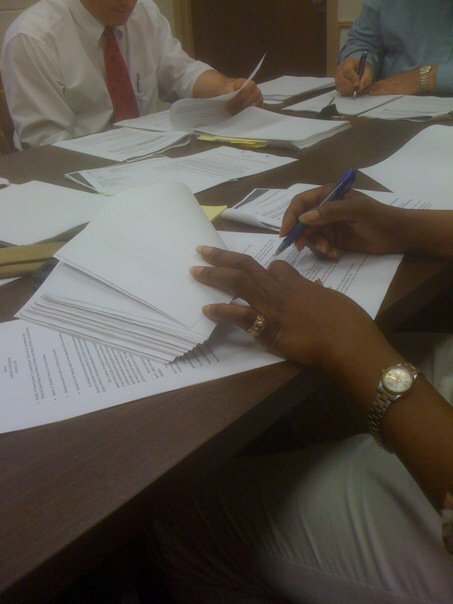 The photo shows the conference table spread with paper from one end to the other. Every member of the committee, 10 or 15 in all, received an approximately 100 page printout of the policies we were supposed to review and for which we were asked to suggest revisions. In this era of marvelous technologies, with web tools like Google doc’s, I don’t know why we have to (1) waste reams of paper at the copy machine and (2) meet for hours at a time in a stuffy conference room poring over proposed hard copies of revisions. To those who argue our budgets are fat, this paper-intensive exercise provides ammunition. It’s one of those “We are the enemy, and it is us” scenarios. First aspect of change: I stopped wearing a wrist watch. Why keep up with time on my wrist? The hour of the day is constantly before me: in my pocket (the iPhone), on the car dash, on digital displays in every hallway of every building where I work. And besides, this summer I won’t have the reverse suntan shadow in the shape of a watch about my wrist and I’ll save $20 or $30 replacing the last wrist watch that was beginning to show signs of demise. Second aspect of change: I abandoned my pocket ink pen. 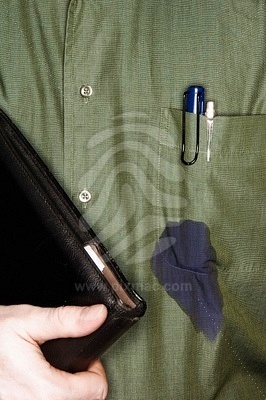 All my life since college, an ink pen in the shirt pocket was wardrobe. This alteration was influenced by the ruin of three favorite dress shirts in recent years due to leaky pen incidents. Lately, I’ve modified my practice to carry a pen clipped to a notebook or folder rather than clipped in my shirt pocket, and then only if I think I’ll need the pen. How many days, in my former life, did I pocket a pen from breakfast to supper yet never etched a word? Up until these past several weeks, I’d have felt naked leaving the house without a watch on my wrist and a pen in my pocket. I’m not sure from what source arose the inspiration or the moral courage to alter these habits, but as a result, I feel refreshed, liberated, . . . improved! Ann is the middle one, sixth from the right or sixth from the left. We visited the Chapel in the Oaks in Baton Rouge today to attend daughter Ann’s commissioning service and a luncheon after for students and parents involved in the China summer trip. The LSU students will go to China as cultural ambassadors to help Chinese students learn English and to cultivate personal relationships. 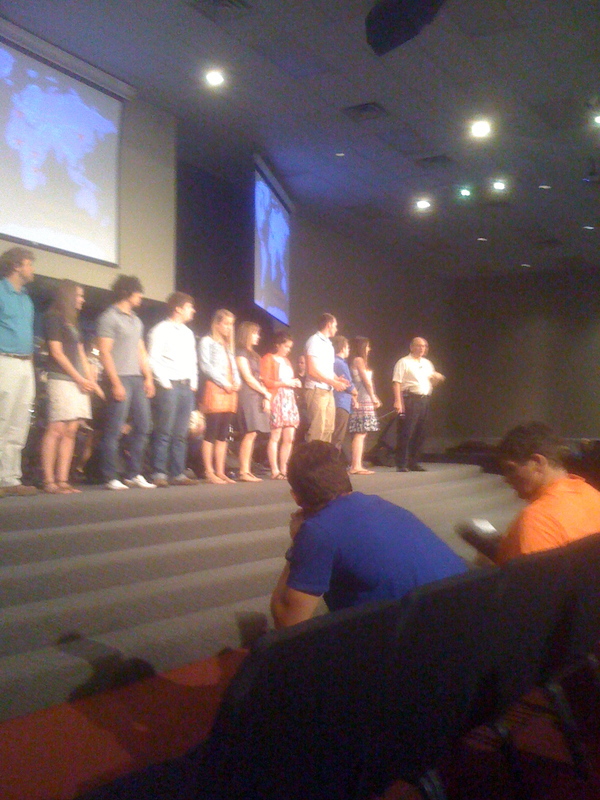 In this pic from the ceremony, count six from the left or six from the right–Ann is smack in the middle. Sarah and I enjoyed the question/answer session after the luncheon where the leaders explained what our kids (and we) could expect. We were greatly encouraged and left more excited about this opportunity for Ann than we were before (and we were already excited!). The organization, the experience, the quality of the leadership–If you’ve got to send your kid halfway around the world to a foreign culture, this is the kind of situation you’d look for. We’re particularly encouraged that we’ll be able to communicate with her with apparent ease. I never realized, for instance, that a gmail account (like the one I have) includes the feature of live, synchronous audio-video conferencing. We’ll be able to video-chat free of charge from one side of the Earth to the other. Ah, the marvels of technology! When this venture first became known late last fall, it seemed so distant. Today I looked at the calendar and noticed we’re not talking about next semester or next spring: We’re down to “next month.” The kids fly from New Orleans to Newark on May 20, followed by a 15 hour non-stop hop to Hong Kong. How well that they’re young–I don’t know if I could stand such a sojourn without a week or so after to recuperate. We recently indulged in the jazz brunch buffet at a stylish New Orleans French Quarter courtyard restaurant. The buffet at this particular establishment makes Shoney’s buffet look like a second-rate soup kitchen. Strategically posted on trees here and there throughout the courtyard are signs admonishing patrons “Please do not feed the birds.” “The birds,” of course, refers to numerous sparrows and pigeons who hang out in the courtyard hoping some patron will disregard the sign. But I got to get a video clip of this enterprising pigeon who took matters into his own hand . . . or, er, maybe his own beak. After one of the waiters cleared a table of leftovers, before the bus boy came to remove the dirty plates, this pigeon declared carpe diem. He apparently didn’t notice the signs, or perhaps he simply couldn’t read, in which case ignorance is obviously bliss. He seemed partial to the left-over grits on one of the plates, in case anyone wonders what he is eating. My latest mowing machine, poised for her maiden voyage Tuesday. I’ve reasoned for years that walk-behind push mowers are not only good for the environment, they’re good for fitness. The extra “oomph” to propell the machine over the hill amounts to heightened heart rate and increased calorie consumption. 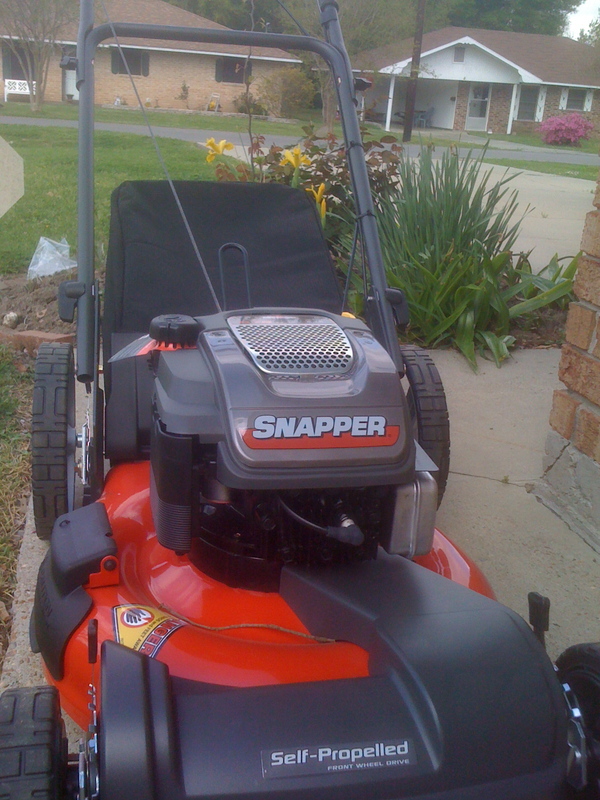 I drew that line Tuesday when I bought a flashy red Snapper self-propelled walk-behind mower. My conscience is at ease because I’m walking, and my bones are appeased because the machine propels itself. How’s that for the best of all mid-life possibilities? I put the new machine through her paces Tuesday afternoon and all was well. A mowing machine? Yes, she moweth well, and she pulleth herself!